Introducing Indigi’s MQ09 Portable Handheld Wireless Bluetooth 4.0 Karaoke Microphone & MP3 Speaker System, plus built-in Disco LED Dance Light. The MQ09 delivers powerful and full sound with a built-in mixer attached to the device! 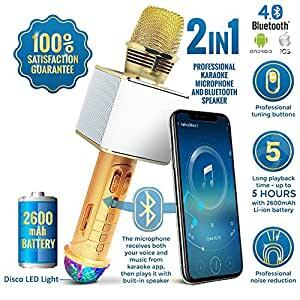 Connect to a device through Bluetooth 4.0 or use the micro SD Memory card and play music directly through the speaker and sing through the microphone for the ultimate karaoke experience! With the HiFi upgraded microchip, the MQ09 delivers clear and crisp vocals that you’d expect while singing or speaking. And because it’s wireless and ultra-compact, it’s easy to take anywhere. Use it at a friends house to sing karaoke, a family reunion, party, or if you’re a street performer, this will replace your loud speaker! With the built-in dual speakers, you get a 360Âº projection of sound. The Indigi MQ09 Wireless Bluetooth Microphone and Speaker Combo can play unplugged up to 5 hours and can be charged from most USB power sources. Bluetooth 4.0 wireless transmission solves the need to carry around an AUX cord, but we’ve included one for you incase your device doesn’t have Bluetooth. It also has a micro sd card or TF card slot to play music from the memory card.